This is height-adjustable pole-mount monitor arm. It can be attached to a pole or a wall. Also to a desk, with optional desk-clamp. 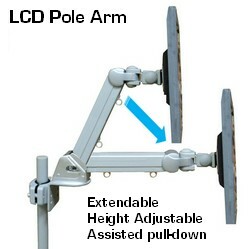 It allows to pull-down the monitor, while extending its reach. You can also make the monitor face 90 degrees to each side, 100% to the floor or to the ceiling (e.g. for horizontal touch screen use). - For monitors uo to 22 lbs. - VESA 100 x 100 & 75 x 75. Adapter available for 200 x 100. 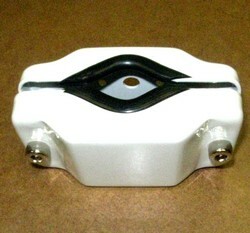 The torque of the monitor bracket can be easily adjusted, as well as the arm's extension. 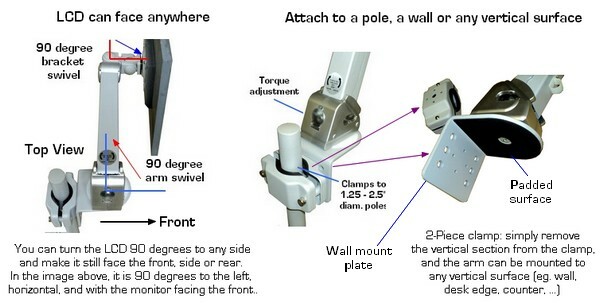 This all-steel pole-clamp LCD arm attaches to common sized poles used in most dental chairs.